Intense Pulsed Light (IPL) is a light-based treatment that targets the many signs of aging—freckles, dark spots, sun damage, and redness—or it can be used to rejuvenate the overall healthiness and tone of your skin by encouraging collagen growth, giving you smoother, younger looking skin. 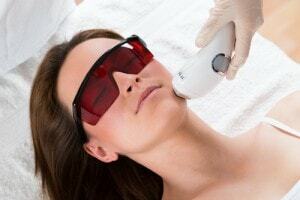 IPL is also used to treat the common chronic skin condition, rosacea. IPL is a safe and effective treatment for targeting the many signs of aging on the skin. A non-invasive treatment, IPL is customized to your individual skin type to see the best results. Before IPL is administered, a technician will gently cleanse the skin and provide you with protective eyewear. The light treatment is administered through a hand-held wand device that is moved across the skin. For most people, the treatment is described as a mild heating sensation or “rubber band snapping”. Ice packs may sometimes be used to increase comfort. After your IPL treatment, skin care products will be applied to soothe and moisturize your skin. Who is not a candidate for IPL? Skin type plays an important role in whether or not you are a good candidate for IPL. Prior to treatment, we will consult with you regarding your complexion and tendency to tan or burn as well as reference the Fitzpatrick Skin Classification Scale to determine if you are an appropriate candidate. If you are currently tanned from recent sun exposure, tanning beds, or artificial tanning; or currently use photosensitive medications or Retin-A, you are not a good candidate. However, if you wait at least one month you may come back and be re-evaluated for IPL. People with a history of keloid scarring may also not be a candidate. Results are typically seen in 4-6 treatments. Each treatment will be given 4-6 weeks apart. Mild or increased redness and crusting of pigmented lesions may occur. Both of these are temporary and short-lasting. Although uncommon, other more serious side effects are blistering, burning, bruising, scarring, hyperpigmentation, and hypopigmentation. Is there any downtime or restrictions? There is no downtime with IPL treatments and you may resume normal activities right away. You should avoid abrasive treatments and excessive heat for 24 hours or longer if you experience redness or a mild sunburn sensation. While undergoing any light-based treatments, daily use of sunscreen is strongly recommended. What can I do to get the best results from these treatments? First, and most importantly, we recommend daily use of a broad-spectrum sunscreen SPF-30 or higher. Additionally, we recommend using quality skin care products. Ask us about our SkinMedica® line of skin care products and we can happily recommend which products would benefit your skin and beauty routine the most. How often should I get IPL treatments? To maintain optimal results, we recommend you get maintenance treatments once or twice a year. To see if IPL is right for you, contact us to schedule a complimentary consultation (484) 723-2086.